Would your property benefit from commercial louvers? These four benefits may be convincing enough. Have you acquainted yourself with the greatness of commercial louvers? If you have a commercial property, it can be a huge advantage to have commercial louvers installed around your perimeter. 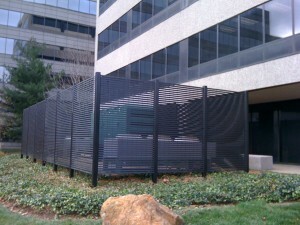 While not as talking about as typical security fences, louvers have many unique benefits that set them apart and make them worth investing in. These are four of the best reasons to consider installing commercial louvers on your business’s property. Trying to keep your property out of the view of pedestrians? There’s simply no better way of doing so than commercial louvers. This can help protect the privacy of employees and clients alike, and if your goal is to create a comfortable, safe atmosphere, commercial louvers are a fantastic way to do so. This is especially true if your property has ground-level windows that may expose a little more than you’re comfortable with. If trespassers is a concern, louvers are a fantastic answer. They prevent anyone from climbing over and getting into your property very simply, but they also act as a psychological deterrent, as most trespassers won’t bother with a facility that takes security that seriously. It’s a fantastic means of protecting against theft or vandalizing alike. As much functionality as louvers offer, they’re also great for something else: making your property look better. It shows off a level of professionalism that aids in establishing your business as legitimate and serious about the work they do. After all, first impressions are everything—and what better way is there to make a good first impression with clients or business partners than a facility that looks prepared for anything. If you’re in an area prone to hurricanes or even just large thunderstorms, you may want some added protection against the weather. Louvers promote airflow and sound to travel, keeping a space still feeling open and casual, but they also prevent heavier winds from causing any damage. This could help minimize any damage against your property if a storm were to occur. This entry was posted on Friday, July 13th, 2018	at 3:19 pm	. You can follow any responses to this entry through the RSS 2.0 feed. Both comments and pings are currently closed.